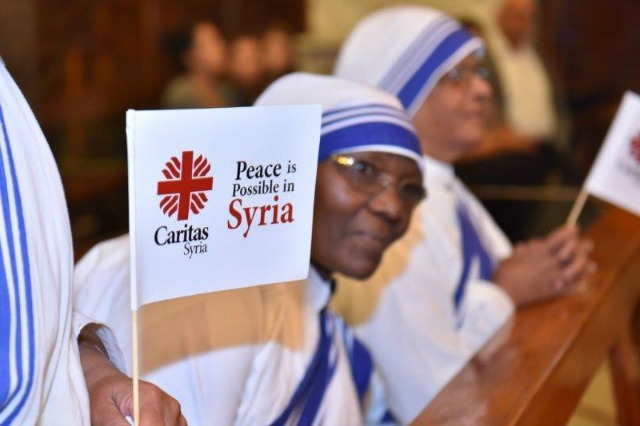 Caritas organisations around the globe took part in prayer for Syria events 31 October with Pope Francis taking part in an ecumenical event in Sweden. 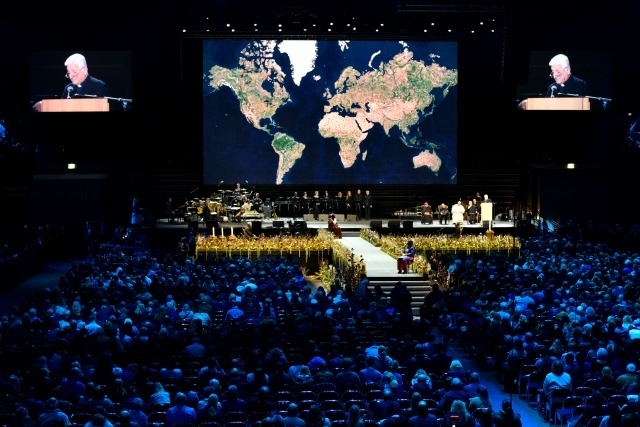 “Each day the news tells us about the unspeakable suffering caused by the Syrian conflict,” said the pope to 10,000 people gathered at an arena in Malmö. 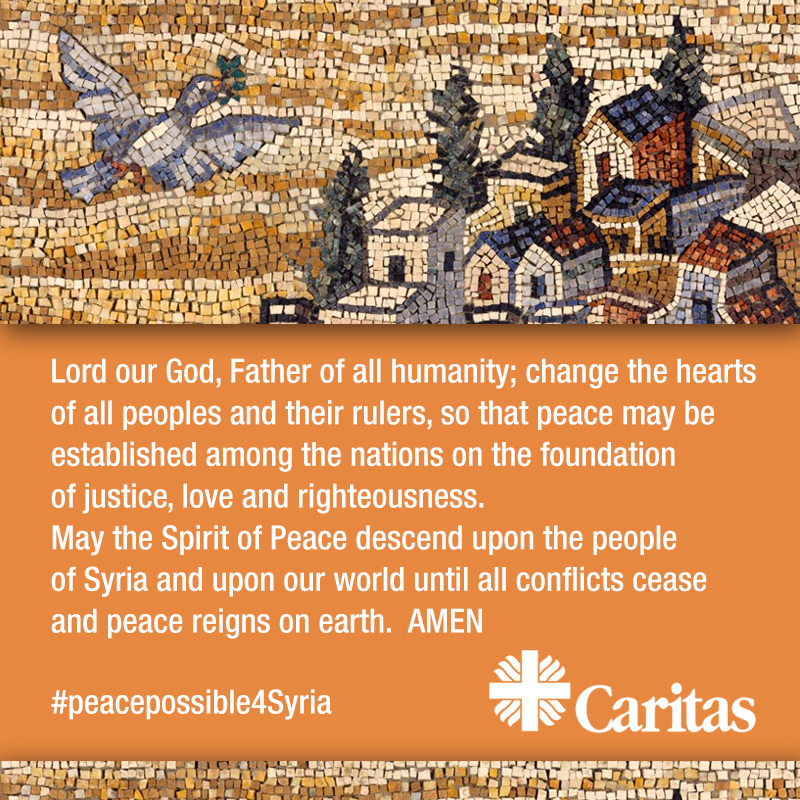 Pope Francis is a supporter of the Caritas Syria: Peace is Possible Campaign. “Let us implore the grace of heartfelt conversion for those responsible for the fate of that region,” he said. Caritas Syria president, Bishop Antoine Audo of Aleppo also addressed the Malmo audience. “The war we are living through every day in Syria, Iraq and the Middle East makes us witnesses of the destruction of our common house and the death of innocent people and the poorest,” said the Chaldean prelate. After half a decade of war in Syria, millions have lost their homes while hundreds of thousands have been killed. A third of hospitals have been destroyed. There are 3 million Syrian children out of school. “The physical and moral deterioration can be read in every face – it reaches everyone especially the poorest,” said Bishop Audo. 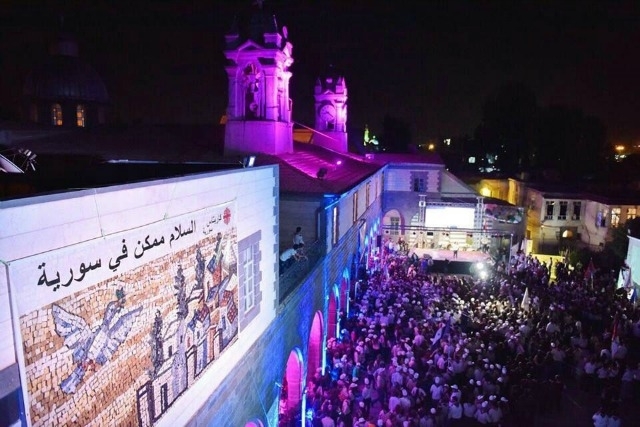 At the same time in Syria Christians from different communities gathered in the Patriarchate of the Greek Catholics in the old city of Damascus for a “Cry for Peace”, organised by Caritas. More than 2500 people attended this event, including Archbishop Mario Zenari, the papal nuncio, bishops of different Christian communities, priests, nuns, different Syrian charities and scout groups. The crowd heard the message of Pope Francis for peace in Syria. Bassel, a young scout, said: “This is the first time I hear this impressive message of Pope Francis, I am proud that it was designated to my country, to my people and to the whole world to work for peace in Syria”. Events also took place in Aleppo. The global prayer was also promoted by Caritas organisations in other Middle East countries, in Asia, Europe, Latin America and North America. 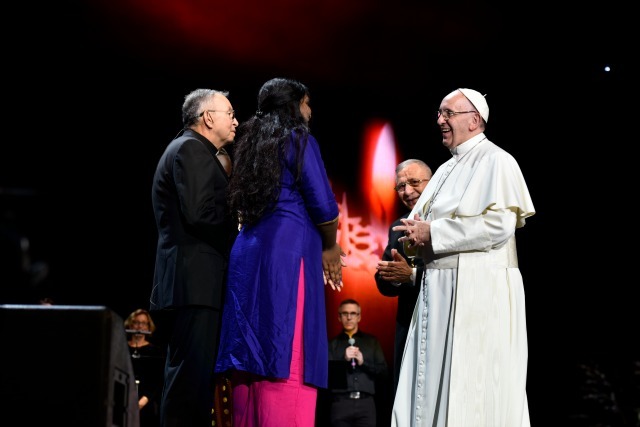 In Sweden, the pope was taking part in the historic Joint Catholic-Lutheran Commemoration of the Reformation alongside Lutheran World Federation (LWF) President Bishop Dr Munib A. Younan and LWF General Secretary Rev. Dr Martin Junge, and leaders from Church of Sweden and the Catholic Diocese of Stockholm. The Lutheran World Federation’s World Service and Caritas Internationalis signed a Declaration of Intent during the ceremony, mutually committing the organisations to closer cooperation in humanitarian response and sustainable development. LWF World Service Director Maria Immonen and Caritas Internationalis Secretary General Michel Roy signed the declaration as a symbol of the shared commitment to expand joint work at all levels. Activities at the arena also included testimonies of Catholic and Lutheran social justice activists from Burundi, Colombia, India, and South Sudan. In Colombia, LWF and Caritas have been working together since 2009 initiating interethnic dialogue and promoting local peace initiatives. “We have been able to join forces with the Lutheran World Federation, to respond to the cry of the communities in need of protection,” said Msgr Hecor Fabio Henao, Caritas Colombia director and one of the speakers.